Soil Analysis Across The Globe | Let's Get Down And Dirty! Before we get into the nitty gritty of soil analysis, we first need to understand soil – what it is – how it came to be – and what it is good for. Soil is different – in different areas of the country and the world – so, to be a successful gardener, we must fully comprehend the soil being used in our garden plot and how we can improve its effectiveness to grow the best veggies. Throughout our life, how many times have we walked across a field – or, dug a hole – or planted a flower or veggie plant and watched it grow? We’ve done all this and, most likely, never even thought about what soil actually is. What would life be without soil? Life, as we know it, wouldn’t exist. Without soil, we could not grow plants to feed animals – or humans. What Makes Soil So Special? Soil is basically the breaking down and decomposition of everything on God’s green Earth – starting a long, long time ago. Water gets into the pores of rocks – cracking and breaking them apart over eons of time. Plants that take root in the cracks of rocks also help in the breakdown process. And, small rock pieces continue to deteriorate into sand – giving soil its minerals. Through evolution, plants, fish, and mammals began coming on the scene. They were born – then, they died – and decomposed – mixing with the rocky minerals. At about the same time, microscopic, soil-loving bacteria – or microbes – began to proliferate and invade the soil mixture. This amazing process has continued since – well, some say, since the Pre-Cambian period over 2 billion years ago – even before oxygen was present in our atmosphere. To sum it all up, the soil under our feet is a combination of minerals – plus dead and living organisms, both plant and animal, in all stages of decomposition. Add a healthy amount of air and water and, we have the top couple of layers on Mother Earth developing into a life-giving medium – well suited for a variety of things – most importantly supplying all critters, including us, with a perfect place for plants to grow and sustain our existence. An Amazing Fact: There are more microbes in a teaspoon of soil than the number of people living on the entire Earth! I could bore you with a lot of scientific mumbo jumbo but, you can get all of that by visiting the websites of soil experts such as The Soil Science Society of America or the USDA Natural Resources Conservation Service. The topmost layer is called the “O” horizon. “O” stands for organics – since this layer is made up of decomposing material such as leaves, dead plants, and other organic matter. Worms spend a lot of time here facilitating the decay of organic matter – which eventually becomes part of the next lower layer – topsoil. 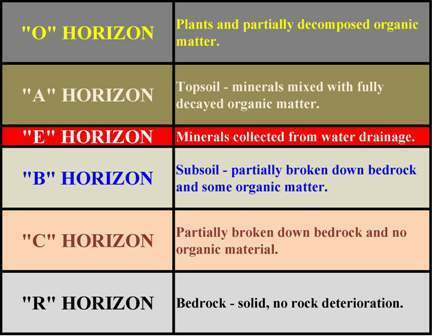 The topsoil layer – just underneath the “O” horizon – is the “A” horizon. Topsoil, also called humus is where completely decomposed organic matter mixes with minerals from the rocks. This layer has a healthy population of living critters. Microbes and worms call this layer home. Most of the nutrients for plants are in this layer, too. Their roots protrude joyously – hither and yon – through this layer sucking up water and nutrients when needed. Stuck between either the “O” and “A” horizons – or, between the “A” and “B” horizons – may be the “E” horizon. Water draining through the organic layer and / or the topsoil washes minerals out of the plant growing area and collects – usually somewhere above the “B” horizon. This process is called, “eluviation” – and, happens mostly in densely forested areas. Going a bit deeper, you’ll get to the “B” horizon – or, the subsoil. Here, you’ll start finding some small pebbles from bedrock that have been mostly broken down. Some organic matter may be in here – but not enough to do much good for plants. The next level is the “C” horizon. The only things here are large, broken pieces of bedrock – bigger than in the “B” horizon. That’s about all there is here. You won’t find much more of anything else. Finally, we come to the “R” horizon – the solid bedrock – one or more big ole hunks of rock with no discernible chunks broken off. This unyielding layer is at the depth where footers are driven to support the foundation of a building – such as your home – or, a skyscraper. The very basic soil structure is broken into 3 types: sandy, silty, and clay. Some argue that there are 4 types – sandy, silty, clay, and loamy. Some diehards steadfastly insist there are as many as 6 types – sandy, silty, clay, peaty, chalky and loamy. 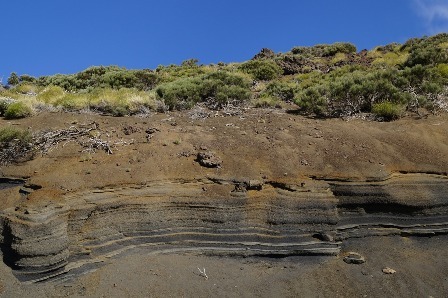 But, all these extra types – peaty, chalky, and loamy – are actually a combination of the basic 3 – which are – one more time – sandy, silty, and clay. Find your state or region here to get the lowdown on a soil analysis for your area. The information provided will give you the best ammunition to make sure your soil is ready to give your garden veggies all the nutrition they need! NOTE: These recommendations do not rule out the necessity of getting a soil test – because, that test will offer the final measures needed to maximize both the nutrients and pH level to ensure an optimum growing season! 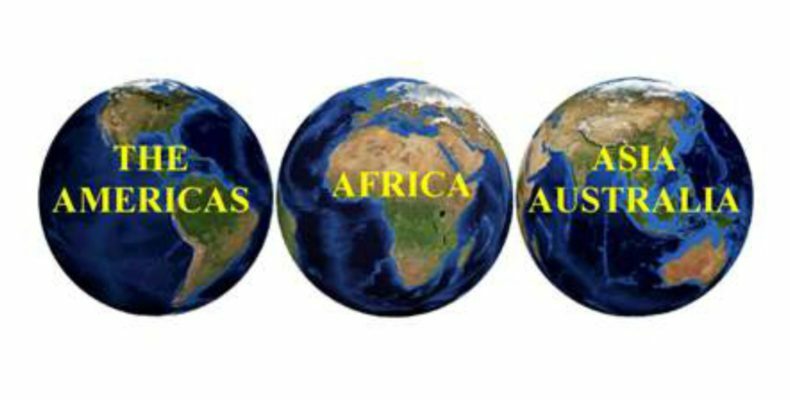 Soil analysis in countries around the world! What Do You Think About Dirt Now? Do you have a new respect for the dirt under your feet – even if you’re steppin’ in mud? Maybe, after understanding how long it took for this lifesaving soil to develop, you will have a brand new appreciation for life on this good ole planet! I anxiously await your comments and emails! Yes, I do have a better understanding of dirt, and the different layers. Who knew?! When I was a young married woman, I had a chance to do some gardening and I noticed how some plants did mega well and others not so much. I guess the soil had a lot to do with it. Gardening can be a lot of fun and if you understand what type of soil you have and ‘how’ it works, I think the experience would be much more enjoyable. Thanks for sharing the low-down on dirt! I look forward to your upcoming articles. I think the majority of folks don’t know just exactly what dirt is – to tell you the truth. And, to better understand how to successfully grow great veggies, it’s important to know everything you can about the dirt you’re using. Don’t forget to check out the soil analysis for the New England area and get some “down and dirty” details for Northeastern states in the U.S.A.
What an educational article on soil analysis. It was really remarkable! 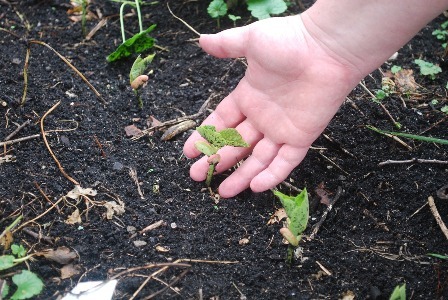 I can see that knowing what type of soil we have in our garden is essential. It’s also good to know that doing a soil test can helps us completely understand what amendments are needed to make the soil nutritious for my garden vegetables. Glad you found my information on soil analysis useful. You will find tons of great, practical information throughout The Perfect Vegetable Garden!